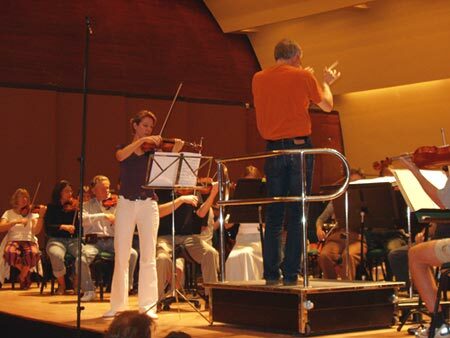 "Rehearsing the violin concerto Hymns to the Night by Tommie Haglund, for the world premiere with conductor Mats Rondin and the Helsingborg Symphony." 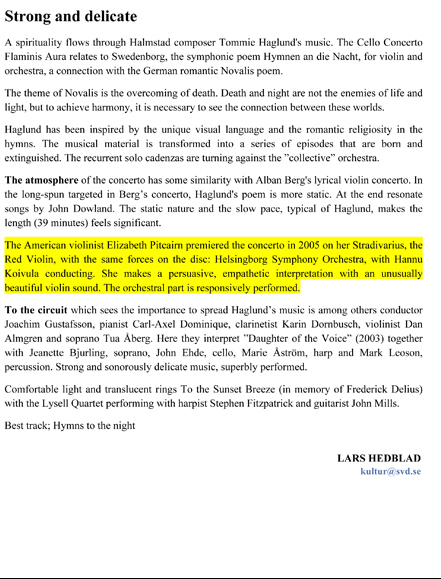 Listen to excerpts of Elizabeth Pitcairn's 9/8/05 Swedish Radio broadcast of the premiere of her commissioned work "Hymns to the Night" by Tommie Haglund with the Helsingborg Symphony. 9/8/06 Cellist John Edhe and Swedish Composer Tommie Haglund after Elizabeth's world premiere performance of "Hymns to the Night" by Haglund, in Helsingborg, Sweden. 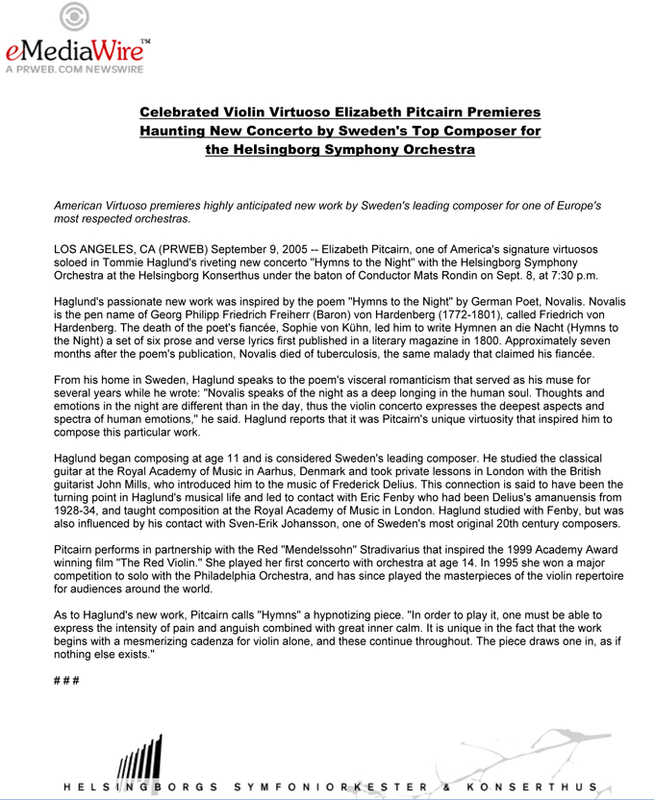 A violin concert does not happen every day, but last Thursday was an exception; The Helsingborg Symphony Orchestra, directed by Mats Rondin, together with violinist Elizabeth Pitcairn brought Hymnen an die Nacht by Halmstad-native composer Tommie Haglund to its premiere performance. 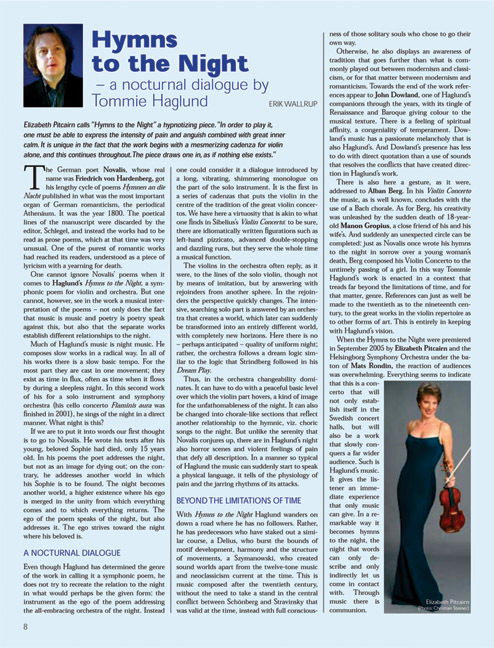 With a fully booked audience, there was a certain tension in the air as Elizabeth Pitcairn brought the bow to her Stradivarius and opened the concert with a several minutes long solo. All together, the violin concerto is laid out more as a dialogue between violin and orchestra than the regular form of a concerto. A couple's night conversation, the orchestra carrying a romantic and dynamic voice, the violin being more strict and low-voiced. They rarely cross their boundaries. 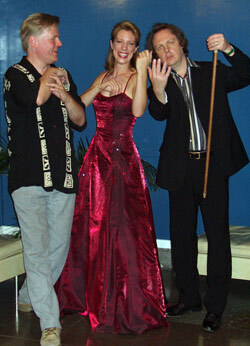 Posing for the CD Cover for the Haglund Violin and Cello Concertos, to be recorded and released in 2007. 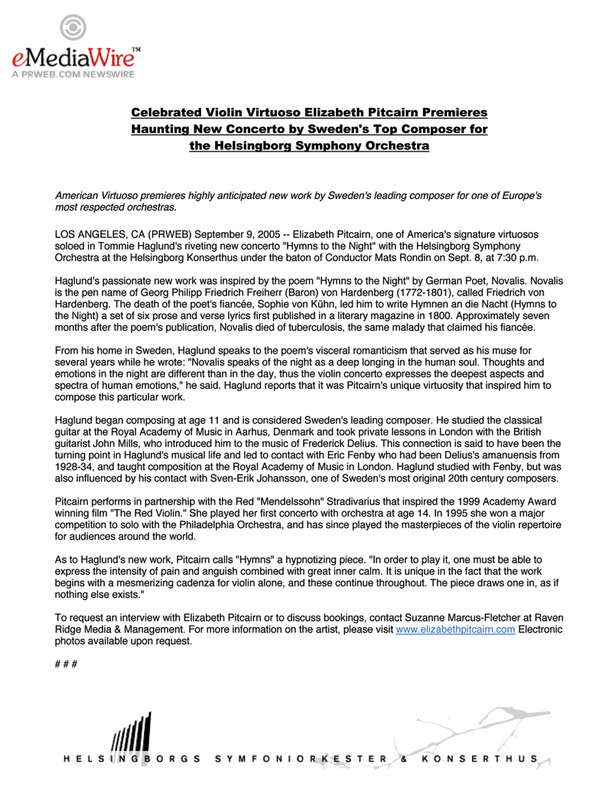 Elizabeth Pitcairn got to play a wide cross section and she brought out the firm and convincing sound of her Stradivarius. The violin concerto was written for her and it was apparent that she felt comfortable with the more difficult sections. 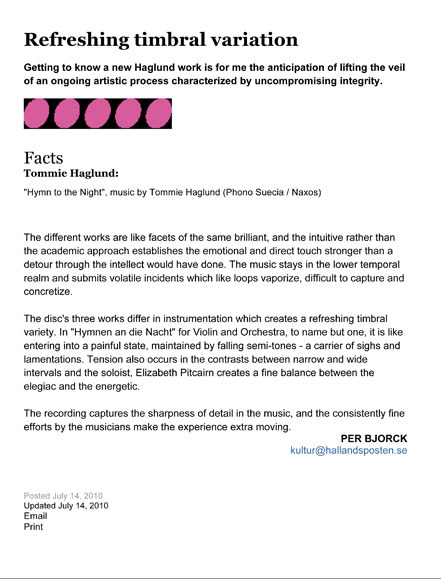 The rich orchestration of Hymnen an die Nacht was very well taken care of by Mats Rondin and the Symphony Orchestra, which had many impressive moments. The darker shades were filled with dynamic breakouts that had a rich but consequent color tone. The entire concerto flows rather slowly, which brings the thoughts to another composer, Allan Pettersson. 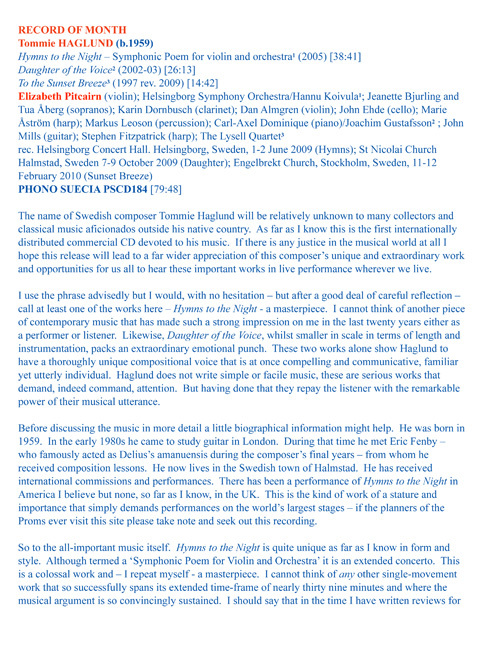 The high class performance of Tommie Haglund's Violin Concerto whets the appetite and the fact that it is being published on CD with Elizabeth Pitcairn and the Helsingborg Symphony Orchestra feels like an asset.